Imagine you're alone in a tiny spacecraft - it's your first time up there, all alone in endless space. Then suddenly - a knocking sound. 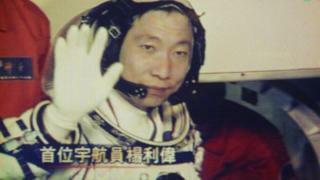 That's what happened to Yang Liwei, China's first man in space, on his maiden flight in 2003. In a recent interview, he has now recalled hearing "someone knocking the body of the spaceship just as knocking an iron bucket with a wooden hammer". "It neither came from outside nor inside the spaceship." Naturally, he got a bit nervous and had a peek out the porthole but failed to spot any explanation for the eerie knock. He's not been able to figure out what it was, neither up in space nor after returning to earth. He has even tried - but failed - to recreate the sound so that experts could help him identify it. Unsurprisingly, the story about unexplained mystery sounds in space has garnered quite a bit of attention. What - or who - was knocking on Mr Yang's spacecraft as he was all alone miles from the safety of the earth? Given that there is no medium for sound to travel, space would be expected to be silent. "The travelling of sound travels requires a medium - be it air particles or water molecules or metal, solid atoms," Prof Goh Cher Hiang, an expert in space engineering at the National University of Singapore, told the BBC. Simple examples for this would be thunder - sound travelling through air, underwater sonar, or a solid musical instrument solid. "If it is knocking, there could be something physical 'hitting' the spacecraft carrying the astronaut," he says - but stresses that any such suggestion is purely speculative. His colleague Wee-Seng Soh brings a different explanation to the table, suggesting it could have been "a result of expansion or contraction of the spaceship, especially since the temperature of the spaceship's exterior could change considerably within the orbit". Mr Yang's days as a spaceman are long in the past but according to Chinese media, the sound has also been heard by subsequent Chinese astronauts on missions 2005 and 2008. In fact, the veteran told his successors about it so they wouldn't be caught off guard and worry about it like he did. So albeit unexplained, he now puts it down as a "normal phenomenon". In fact, it's not all that unusual to hear sound in space - and it's also not unusual to not find a conclusive explanation for that sound. In 1969 a test flight for the Moon landing mission orbited the Moon, and on the far side while cut off from radio contact with Earth, the astronauts heard a strange sound they couldn't explain. The whistling sound was described as space music by them, but the information was held classified until recently. An actual recording of the sound was only made public earlier this year. Nasa's explanation was that it must have been some sort of radio interference - rather than, well, aliens. Later space missions also recorded similar sounds and Nasa released the recordings of the Juno space probe orbiting Jupiter.